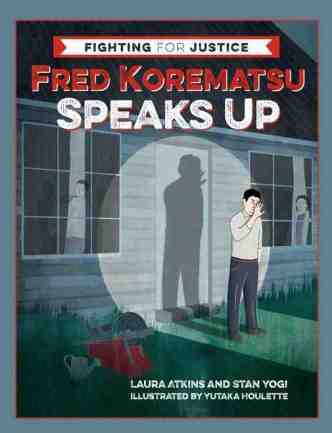 BERKELEY — Heyday Books will release “Fred Korematsu Speaks Up” at the end of January to coincide with Korematsu’s birthday (Jan. 30) and the 75th anniversary of the signing of Executive Order 9066 (Feb. 19). Written by Laura Atkins and Stan Yogi and illustrated by Yutaka Houlette, this is the first book in the Fighting for Justice series. Korematsu liked listening to music on the radio, playing tennis, and hanging around with his friends — just like lots of other Americans. But everything changed when the United States went to war with Japan in 1941 and the government forced all people of Japanese ancestry to leave their homes on the West Coast and move to distant prison camps. This included Korematsu, whose parents had immigrated to the U.S. from Japan many years before. But he refused to go. He knew that what the government was doing was unfair. And when he got put in jail for resisting, he knew he couldn’t give up. Inspired by the award-winning book for adults “Wherever There’s a Fight,” the Fighting for Justice series introduces young readers to real-life heroes and heroines of social progress. The story of Korematsu’s fight against discrimination explores the life of one courageous person who made the U.S. a fairer place for all Americans, and it encourages all of us to speak up for justice. Atkins is an author, teacher, and independent children’s book editor with over 20 years of editorial experience. She worked at Children’s Book Press, Orchard Books, and Lee & Low Books, helping to produce winners of the Coretta Scott King Award and American Library Association Notable Book selections, among others. She taught creative writing at the National Centre for Research in Children’s Literature (NCRCL) in London, where she also received her M.A. in children’s literature, and she completed her M.F.A. in writing for children and young adults from Vermont College of Fine Arts in 2016. In addition to co-writing “Fred Korematsu Speaks Up,” Atkins is the author of the lighthearted picture book “Sled Dog Dachshund” (Minted Prose Press). Passionate about diversity and equity in children’s books, she is based in Berkeley, where she lives with her daughter. Yogi is the co-author, with Elaine Elinson, of “Wherever There’s a Fight: How Runaway Slaves, Suffragists, Immigrants, Strikers, and Poets Shaped Civil Liberties in California.” He managed development programs for the ACLU of Northern California for 14 years and is the co-editor of two books, “Highway 99: A Literary Journey Through California’s Great Central Valley” and “Asian American Literature: An Annotated Bibliography. His work has appeared in The San Francisco Chronicle, MELUS, Los Angeles Daily Journal, and several anthologies. He is married to nonprofit administrator David Carroll and lives in Los Angeles. For more information, visit http://heydaybooks.com.